In 2009, U.S. Secretary of State Hillary R. Clinton joined with the Foreign Ministers of Cambodia, Laos, Thailand, and Vietnam in launching the Lower Mekong Initiative to enhance U.S. engagement with the Lower Mekong countries in the areas of environment, health, education, and infrastructure. Part of the Lower Mekong Initiative, the U.S. Geological Survey's Forecast Mekong project is engaging the United States in scientific research relevant to environmental issues in the Lower Mekong River countries and is staying the course in support of the Mekong Nations with a suite of new projects for 2011. 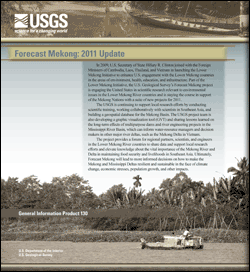 Turnipseed, D.P., 2011, Forecast Mekong: 2011 update: U.S. Geological Survey General Information Product 130, 8 p.